All vegetable fibres other than cotton are multicellular bast fibres. They are composed of bundles of many cells held together by surface attraction. They are not attached to seeds as are cotton hairs but are usually part of stem structure or some other tissues of plant.Flax or Linen, Jute, Hemp, Ramie and related fibres are bast fibres, which occurs in between the outer bark and the woody central cylinder. The second important bast fibre obtained from the various species of corchorus native to India and the East India Islands.Jute has been cultivated in India from time immemorial. Most of the world’s supply of jute comes from Bengal,where it is cultivatedin the alluvial soil of the delta regions of the Ganges and Brahmaputra.After the ground has been prepared by ploughing,the seeds are sown between February and June according to climatic conditions. The plant grows to a height of 5 to 15 feet and stems are harvested shortly after the flowers have appeared.The plants are either cut or pulled when the setting of seedpods begins. Jute also must be retted in order to remove the woody parts of the same. They are retted by immersion in water from 12 to 15 days. The retting is complete when the fibrous layers can be separated freely from the cane itself. In this process, jute plants are subjected to warm and humid atmosphere by simply stretching over green grass for 20-25 days in thin layer with occasional turn over.By this process, all the jute stalks get a direct exposure to bright sunlight in day time and moisture of at night. Gradually leaves and small branches loose bark or skin comes out. 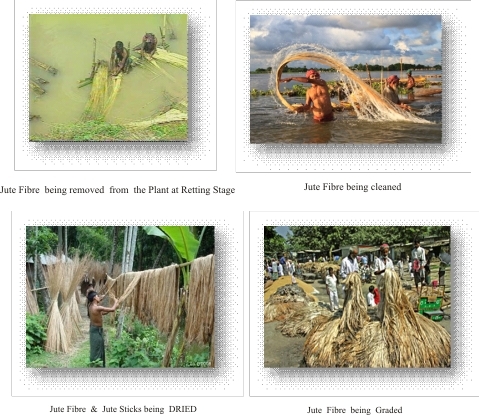 In this process, jute is retted in pond or tank. Jute stalk bundles are immersed under water. After a few days of fermentation the stalk floats upon the surface of the water due to fermentation of carbon di oxide inside the bundles. After a few days, the colour of the bundle gradually changes from green to yellowish green and then yellow. Then the bundles are taken out after proper retting and the fibres are pulled out form the stalk.The time required for retting is 10 – 20 days, depending upon the water temperature and condition of stalk. Chemical retting consists of softening the tissues by boiling with 1% sodium hydroxide or 0.5% H₂SO₄ at boiling temperature for 6 – 8hours.The gumming and pectic matter hydralised and degraded to their respective lower product and the fibres are washed with clean water. The dry jute stalks are broken by passing through fluted roller known as crushing.Clean jute fibre is extracted from these fibre bundles by a process known as hackling. The hackling can be carries out manually or mechanically.In this process the hard particles and woody matters present in jute fibre are crushed and removed.